Maury Mort’s brother Maury can be found sitting in front of the tube watching “The Big Lebowski” on dvd when he’s not at the bowling alley. 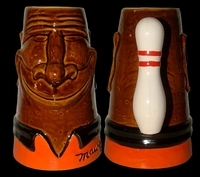 Maury measures 7 ½” in height and holds 30 oz. Maury prefers a White Russian over a brewski, unlike his brother Mort.